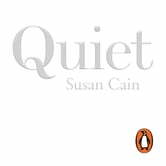 The unabridged, downloadable audiobook edition of Susan Cain's ground-breaking book Quiet, brilliantly read by Kathe Mazur. In Quiet, the international bestseller, Susan Cain shows how the brain chemistry of introverts and extroverts differs, and how society misunderstands and undervalues introverts. She gives introverts the tools to better understand themselves and take full advantage of their strengths. Passionately argued, superbly researched, and filled with real stories, Quiet will permanently change how we see introverts - and how you see yourself.